Trade show accessories will make any trade show display stand out at your next convention. We carry everything from counters to lighting so you can customize your booth and make it unique. We also offer a full line of trade show table covers and shipping cases that are in stock and ready to ship. 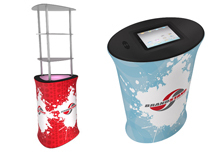 Trade show accessories are ideal for adding onto your current booth or combining with current display purchase. 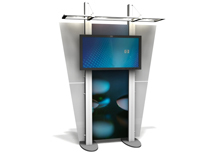 We have many lighting and case options that will work with all of our pop up displays and banner stands. Most of these accessories are compatible with all display brands and you can email us to check if your display is compatible with our accessories. How can Accessories help your booth? 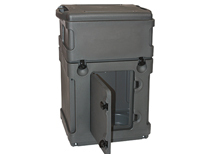 Shipping cases are ideal for any exhibitor shipping products across the country. We offer multiple size shipping cases that will fit almost any trade show display. Most of our cases are in stock and can ship same day or next day. Lighting is a great way to showcase your products or graphics in your booth. 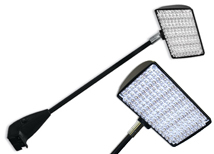 We offer options for spot lighting and flood lighting as well as LED lighting and banner stand lights. Most of our lights come with universal clamp kits so they can fit on almost any display! 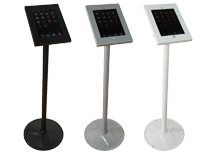 Freestanding iPad stands are a great addition to trade shows or events. They can turn a regular booth into an interactive media center. There are three colors available in stock and ready to ship! For use ONLY with iPad 2, 3, and 4 - iPad NOT included. 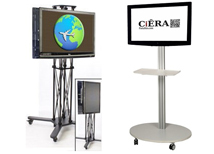 Mobile TV stands are perfect for trade shows and events where media presentations are a must! All of our stands are portable and can assemble in minutes! 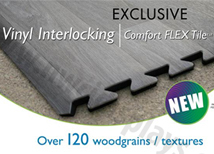 We offer a full line of trade show flooring to compliment your booth including interlocking tiles, bamboo, and digital printed flooring! Trade show accessories are great alternatives to renting from overpriced convention halls. All of our accessories are easy to ship with UPS or Fed Ex making them ideal for trade shows and exhibitors on the go. 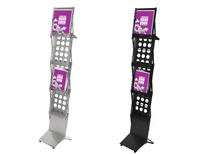 We have lights for retractable banner stands that are specifically made to fit on banners. Our counters are affordable and stylish making them a great addition to any booth. Locking storage and internal shelves are just a few options available on these unique trade show accessories. Many of our cases can convert into podiums creating a duel purpose counter that can also ship your display around the country. Trade show table covers are a great option for exhibitors who utilize tables in their trade show booth. We have custom dye sublimated table throws that can be completely customized with your companies logo or any other artwork. These covers are very durable and offer more options than standard imprinted table throws. 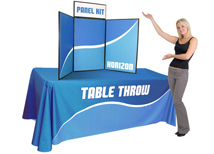 Using these table covers with a table top display is a great way to make your booth stand out among your competitors. Accessories are a critical component in creating a successful first trade show; our article goes over every aspect. Trade show accessories are ideal for accenting any booth space at a trade show, conference, or lobby. Table throws are one of the easiest and cheapest ways to really stand out at an event. It can take an ordinary folding table and make it a branding opportunity. Dye sub table throws are by far the most popular option because of the vibrant full color printing. These can be utilized for markets, fairs, and even professional lobbies. 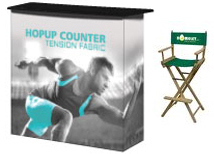 The ultra fit table throw can make any standard table look like a custom counter! Literature racks also offer the same versatility as table throws. They can be used for almost any purpose including shopping malls, store fronts, or kiosk locations. They are a compact, effective way to display literature without a pushy sales person. There a variety of styles available to work with any design theme! We offer a variety of trade show lighting that can work with displays, tents, back walls, and pipe and drape structures making it possible to brighten up any booth!